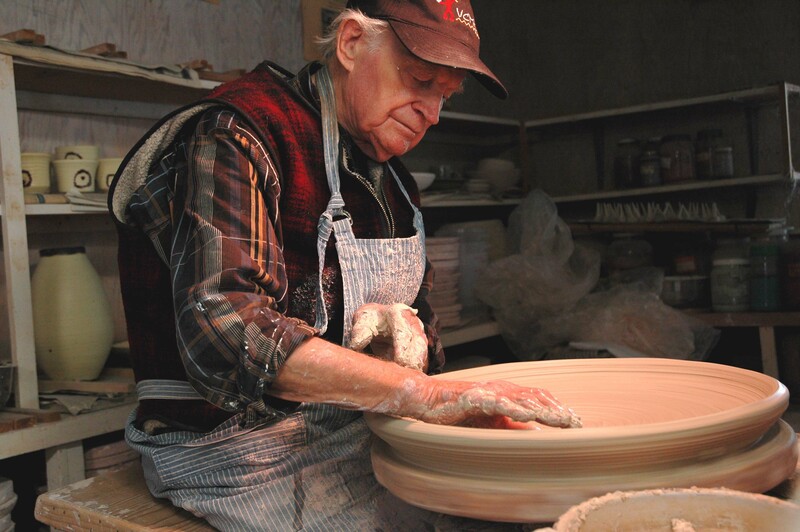 Ojai has always prided itself on being a mecca for artists. But up until 1984, the truth was far less impressive. People who came to town expecting to see artworks often were disappointed, because the works were inaccessible, hidden away in the artists’ studios. The Ojai Valley was filled with art, but for all intents and purposes it was invisible. “It was like the best-kept secret in Southern California,” says longtime Ojai gallerist Hallie Katz, co-owner of Human Arts. That began to change when a group of local artists banded together to launch an open-studio tour, which became an annual event. Three decades and 31 tours later, Ojai has come of age as a haven for artists and a travel destination for art lovers — and the Ojai Studio Artists have been instrumental in turning the perception into reality. The OSA story begins in 1983, when the painter Gayel Childress took charge of the moribund Fine Arts Branch at the Ojai Art Center. The venerable building on South Montgomery Street housed California’s oldest continually operating non-profit community art center, but its dilapidated gallery space offered an uninspiring venue for art shows. At the time, there were relatively few galleries in town, and the Ojai Valley Museum did not concern itself with contemporary art. Apart from the Art Center, artists who wanted to show their work generally had only one option: The parking lot of the Security Pacific Bank (now the Bank of America), which on Sundays hosted an outdoor art market. Otto Heino, photographed by Cindy Pitou Burton. Childress’s first priority was to raise money to fix up the Art Center’s dowdy-looking lobby and decrepit gallery, to give local artists a better showcase. Two Arts Branch members, painters Bert Collins and Marta Nelson, had an idea. They recently had taken a tour of private homes in Los Angeles as part of a fundraising event for the L.A. Philharmonic. “We thought, ‘Hey, what if we did that here with our studios?’ It was kind of like, ‘Hey, let’s put on a show,’ “Nelson says. The second and third annual tours were even more successful. Now known as “The Artists Of The Ojai Studio Tour,” the event attracted the attention of Sunset Magazine, which praised it for providing visitors with ready access to celebrated artists like Bert Collins, George Stuart and Beatrice Wood. (A list of other prominent artists associated with OSA at one time or another during its history would include the potters Otto and Vivika Heino and the photographer Horace Bristol.) After only three years, the studio tour was already well on its way to becoming an Ojai institution. By 1986, putting on the tour had become almost a full-time job for Childress, Collins and Nelson, leaving them little time to paint. They had accomplished their initial goal, which was to refurbish the Art Center. After the third tour, they handed the event over to a local impresario, John Hazen Perry, who had big plans to take it to the next level. Under Perry’s guidance, the 1987 tour featured an impressive, expensively produced brochure that was almost akin to an exhibit catalog. Perry aimed to turn the event into a full-fledged arts festival by adding music and dance. So he produced a multimedia extravaganza at Matilija Auditorium to coincide with the tour. Thirty-five artists opened their studios to the public that year, but Perry’s new features cost a lot more than they brought in, and the tour lost money. Exit Perry, after only one year at the helm. The tour then passed to Ojai Events Ltd., which consisted of several local business owners (including Les Gardner of the Attitude Adjustment Shoppe) who tried to operate the tour for a profit. But this group had little experience managing artists. In what turned out to be a controversial move, the new producers brought in an outside art expert to jury the tour and thus raise its artistic standards. Unsurprisingly, this created ill will among those artists who did not make the cut. Things did not go smoothly for Ojai Events Ltd., and in 1988 the tour lost money for a second consecutive year. Meanwhile, some of the artists were beginning to take matters into their own hands. One day in 1988, the printmaker Linda Taylor and the potter Vivika Heino were lamenting the tour’s decline, and wondering how it could be restored to its original purpose: to showcase art and benefit the community. “We could do this ourselves,” Heino told Taylor. That conversation planted the seed. About 20 artists, including the tour’s three co-founders, convened on the back deck of Taylor’s Drown Street home to form a new artists’ cooperative. They decided to adopt standards for membership, to ensure that everyone in the group would be a professional artist whose work had been recognized for its quality. And they decided that they would operate the group on a nonprofit basis, using the proceeds to support the arts in Ojai. At this point, Ojai Events Ltd.was still operating the annual studio tour. But Gardner and his partners bowed out after the 1989 event. “It became a lot more hassle than it was worth,” he says. But the fledgling artists’ cooperative was not yet in a position to take over the tour. So in 1990 there was only an informal mini-tour, featuring four artists with studios in the East End or the Upper Valley — Gayel Childress, Audrey Saunders, Nancy Whitman and Beatrice Wood. Meanwhile the artists’ cooperative struck an alliance with the Ojai Valley Chamber of Commerce, which agreed to act as the tour’s financial receiver in return for a cut of the proceeds. And so the event was reborn in 1991 as the Ojai Studio Artists Tour – the 11th annual tour but the first under the OSA name, which it has proudly carried ever since. Khaled Al-Awar, who owns Ojai’s Primavera Gallery, credits the OSA tour with boosting the community’s reputation as a destination for art lovers. In 2006, OSA acquired its 501(c) 3 designation as a non-profit organization, severed its connection with the Chamber of Commerce, and began operating the tour entirely on its own. The Great Recession that began in 2008 posed a daunting challenge, yet OSA has endured. Each year, more than 50 members open their studios to visitors as part of the annual tour. Taking the Detour participants into account, more than 100 art studios in the Ojai Valley typically are open to the public each year during the second weekend in October, reflecting the enormous growth of Ojai as an arts mecca since the original 1984 tour first put the town on the map. The OSA story reveals how a group of talented, temperamental artists have managed to work together to create an enduring legacy: Ojai as a special place where school-age artists are nurtured, emerging artists are supported, and mature artists are celebrated.